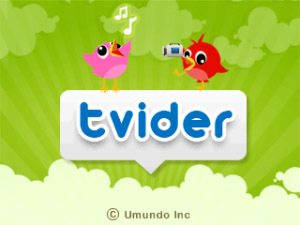 Tvider is service through mobile applications or computer can quickly and easily share video, audio and pictures on Twitter. From your computer, through Tvider widget can record a video with your webcam and send the tweet with the link of the same for your followers will see. Also, mentioned right at the beginning, it can be carried out by a mobile app and can download it for iOS, Blackberry, Symbian, and Android and soon for Windows Phone. In this case when we list the average, Tvider sends a Twitter with a link. To access the service one has to connect with the credentials of the Twitter account and authorize the application.